Some websites like pandora.com, hulu.com, ABC.com, BB.co.uk etc. are restricted to be available only in certain countries. The trick to open any such website is to use a VPN service or a proxy based in that country. 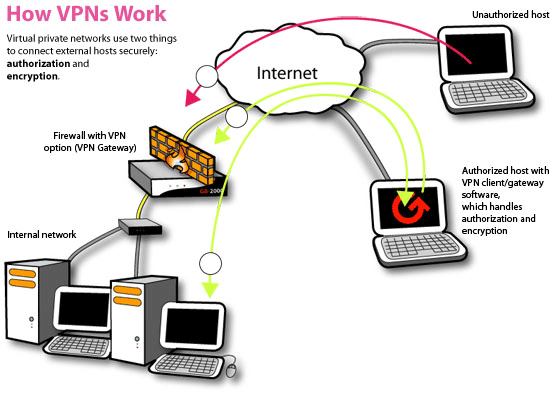 The image below shows the overview of how the VPN actually works. For more details you can refer to this page. There are both paid and free VPN services available. Below is the list of the best free VPN services for US, UK, China, India etc. AlonWeb – AlonWeb is a free VPN service provider with servers located in Panama and Netherlands. You can choose the server you need on their website. So if you need an IP address of Panama or Netherlands to open some blocked site, than AlonWeb is an option. The monthly bandwidth cap for using AlonWeb is 1 Gb, so be careful before checking video sharing or image heavy sites through this VPN. The only issue with AlonWeb is that it injects inline ads on your browser. But that should be ok as its completely free! PacketiX is very fast VPN service. To start using it download the PacketiX VPN connection manager, install it, and connect it. That’s it! CyberGhost – CyberGhost is also a free VPN service with servers based in Germany. So if you ever need a German IP address to open a website, use CyberGhost. With free VPN service, the bandwidth cap is 10GB. If you need more then you can opt for premium plans. LogMeIn Hamachi – LogMeIn Hamachi is probably the most easy to setup VPN service. Other then providing the VPN service, it also allows sharing of files and folders over the VPN. Its free for non commercial and personal use. OpenVPN – OpenVPN is the most secure and private VPN service available today. Its basically a SSL/TLS based VPN service. To use OpenVPN services, you must first install the OpenVPN client on your machine, which is available for all the operating system. The only drawback with this service is that OpenVPN client is not available for any mobile devices yet! AnchorFree Hotspot Shield – We have already explained how to use Hotspot Shield to get a US IP address. Its a completely free service except that it injects ads in the browser. SecurityKiss – If you need a secure VPN then SecurityKiss is for you. It tunnels all your connections through a secure and encrypted gateway, thus ensuring security of your data. UltraVPN – UltraVPN is basically an OpenVPN client that has servers based in France. So if you ever need a French IP address to open a website, then UltraVPN is the way to go. ItsHidden – ItsHidden is a VPN service for torrent users. The main purpose of ItsHidden is to help torrent users to hide their IP while downloading files via torrents. It has premium as well as free plans and its available for all platforms including the mobile devices like iPhone. GPass – GPass is a free, encrypted proxy server that helps you open blocked websites by giving you a random IP. Its probably the fastest proxy service and its also very easy to setup. Loki Network Project is a free SSL based VPN service with servers based in US. You can start using it without any registration, although the speed is a bit slow compared to other VPN services. Ace VPN Ace VPN is VPN service based on OpenVPN. Ace VPN has both paid and free plans and you need to download and install the Ace VPN client to start using its VPN service. If you know about any other free VPN services, then do let us know using the comments form below and we will update this list after testing it.